Visualization is fundamental to data analysis. A good visualization allows to present a magnitude of data in a simple and concise manner. Visualization can be done with graphs, diagrams, images, or via software applications that provide navigation through the data. A scatterplot (or scattergram) represents the size and intensity of a cell population. Cells that are “different” from the others, are defined as outliers and circled in red. The black rectangle is a “boxplot” centered around the medians. 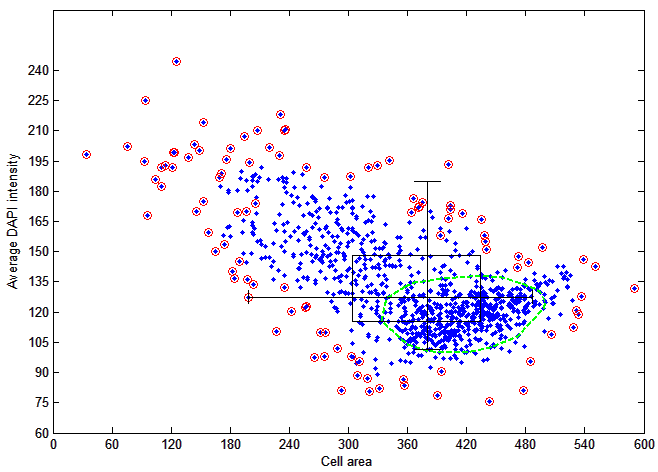 The green curve is positioned at the most dense area of the scatterplot, and contains 50% of the cells. The graph represents the histogram of intensities of the cell population. By clicking on a bar in the histogram, the user selects all cells belonging to the interval of the bar. The selected cells are shown in red, while the others are blue. This confocal image (Leica SP5 63x) represents multipolar neurons (red), glial cells (green) and their nuclei (blue). The various components of the image are automatically detected and saved as separate images for each color. The superimposed image (blue + red + green signal) visualizes all elements and their interaction. Original image from Christopher Wallace, Ginger Withers and Tony Cooke (CC Attribution Only).